The Doctor: You — are — my — enemy! — and I am yours! You are everything I despise. The worst thing in all creation. I’ve defeated you. Time and time again, I’ve defeated you. I sent you back into the Void. I saved the whole of reality from you. I am the Doctor, and you are the Daleks! Winston Churchill calls The Doctor and Amy to London, 1940 in the middle of the Blitz. Churchill was worried about the new weapons one of his scientists have created but now he is assured that they will win him the war. The Doctor discovers that the new weapons are, in fact, the Daleks. They have a plan and this time they need The Doctor. I will admit that I was not the biggest fan of Victory of The Daleks on first viewing back in 2010. This meant that when I came to re watch it two years later, I was slightly nervous that I would still not like it. Watching it a second time, I discovered that it was really very good. The acting, effects, plot and music were much better than I remembered them. This just goes to show, that the memory cannot be relied upon to judge episodes by. I must note though, that the part with the Spitfighters attacking the Dalek ship does still annoy me slightly as it seems more science fantasy than science fiction. 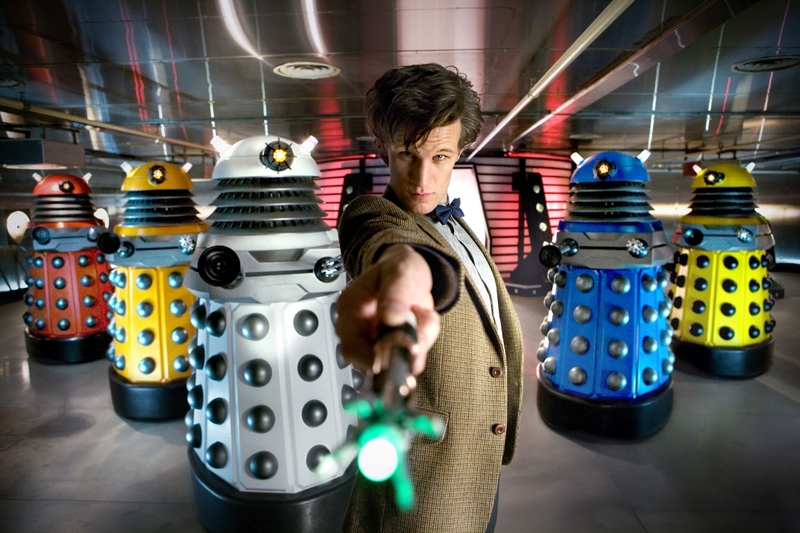 Matt Smith portrays The Doctor wonderfully in this episode. Normally a new Doctor has time to settle into his new body before getting pitted against the Daleks. (Tennant didn’t face them until the end of his first series.) However, Smith after only two episodes was pushed in at the deep end. He works well with Gattis’s great script. In this story, Smith seems almost Pertweean, particularly during his attacks on the Daleks. This works well for the story as Smith becomes quite action hero like throughout the episode but never lacks that Smith charm. We experience the Smith charm mainly in the scenes with Churchill, which gives some nice comedy parts which without them would have made the story far grimmer. Ian McNeice is believable as the grumbling, Winston Churchill. The character goes well with Smith’s Doctor so much so that they seem to bounce off each other. McNeice’s performance soars during the scene when Churchill and Amy find Bracewell about to commit suicide. McNeice looks like Churchill and sounds like him. It is a very believable portrayal. Murray Gold’s theme music is outstanding particularly when the Spitfighters attack the Dalek space ship and when The Doctor is rushing out of the TARDIS to stop Bracewell from exploding. This is another aspect of the episode which makes it so memorable. Victory of the Daleks is a brilliant episode and it seems better on a second viewing then on first viewing. With sharp witty dialogue, great acting, nice effect and a great score, Victory of the Daleks stands as one of the Dalek’s true victories.